Backup4all 7.3 was released, a major update with several improvements. You can download the new version here: Download Backup4all. GDPR compliance changes. The General Data Protection Regulation (GDPR) is a regulation in EU law on data protection and privacy for all individuals within the European Union, that becomes enforceable on May 25th, 2018. We value your privacy and we’ve taken extra measures to ensure that we comply with GDPR in regards to the data we collect from you. That’s why, the main change you’ll notice is that when activating/changing your key the personal data is optional. Thus, if you don’t want to have your name/email collected you can only enter the product key and activate it. We do recommend entering at least your email to be notified of future updates, but that’s up to you. Checkbox visibility on Windows with no theme. On the main window of the installer there is a checkbox that allows users to decide if they want to send anonymous usage statistics or not. On Windows installations that were not using any themes, the checkbox wasn’t visible enough, so we modified it completely now to be more visible. As a side note, the usage statistics sent are truly anonymous as we don’t transmit the IP or other particular details about you. 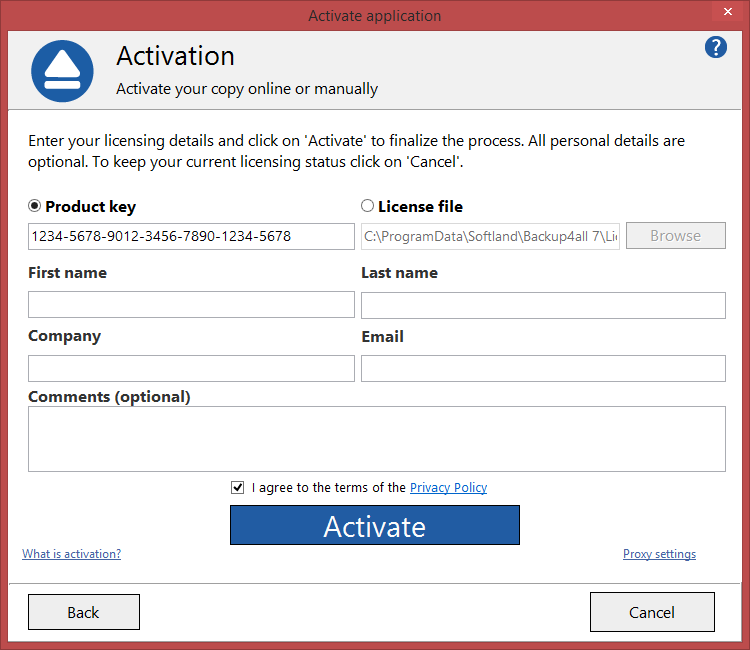 However, this version is not free for users of previous versions of Backup4all (1.x – 6.x). 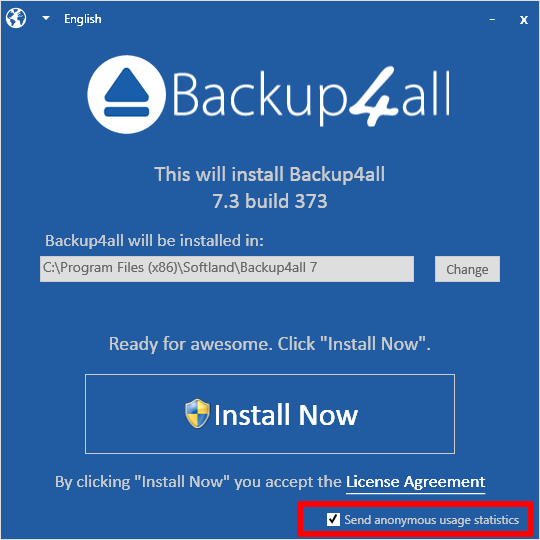 If you own a previous version and want to test Backup4all 7.3, you can install a 30 day free trial here: Download Backup4all 7.3. This entry was posted in News, Version History and tagged backup4all 7.3, changelog, timeline. Bookmark the permalink.